Most wide-release, non-Disney animated movies are pretty hit-or-miss. Often, they fail to provide both a friendly, in-theater experience for kids and a film that can be enjoyable for adults. Movies like “The Emoji Movie,” “Despicable Me 3” and “The Boss Baby” have highlighted the lazy and fruitless hole movies made for children to fall into. “Smallfoot” is co-director Jason Reisig’s first feature-film, and he is joined in that effort by director Karey Kirkpatrick, known for 2006’s “Over the Hedge.” The story is based around a tribe of yetis who live high in the Himalayas. The film’s main yeti-character, Migo (Channing Tatum), is banished from the village after claiming to have seen the mystical “smallfoot,” their term for humans. I was pleasantly surprised by “Smallfoot.” I thought it was going to be a middle-of-the-road kind of animated movie. It would have a couple interesting moments, but overall wouldn’t leave an impression. 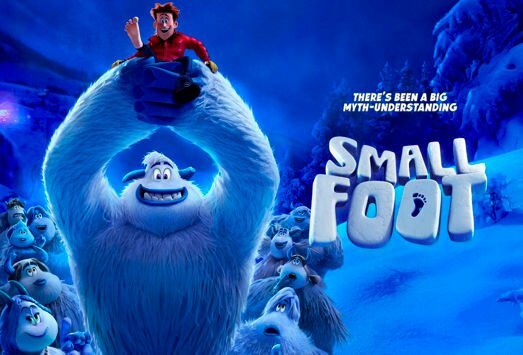 As it turns out, “Smallfoot” is a delightfully original and unexpectedly poignant film about challenging the status-quo and accepting others despite their flaws. The themes in “Smallfoot,” despite being hidden behind a children’s animated movie, manage to be legitimately resonant and adult. The film’s plot kicks in when Migo meets Percy (James Corden), a fame-seeking nature-TV host. The character of Percy shows both negatives and positives about humanity. Yes, he can be selfish and manipulative, but at his core, he’s an empathetic and caring character. Those traits apply to both the humans and the yetis in “Smallfoot.” There are good and bad people, and there are good and bad yetis; beyond that, those people and yetis have much more to them than just being “good” or “bad.” “Smallfoot” shows that everyone, no matter how they look, has different layers to their personality, and you might be surprised when you get to know someone better. In addition to Tatum and Corden, “Smallfoot” features the voice talents of Zendaya, Common, Danny DeVito and LeBron James. The performances given by each actor were actually remarkable. They each brought an added sense of emotion and personality to their characters. Additionally, the soundtrack to the movie is surprisingly catchy, and I’ve found myself listening to a couple of the tracks on repeat since seeing the movie. Each song serves a purpose in the story. They move the plot forward in a way you’d expect from any good musical. The song “Percy’s Pressure” uses Queen’s “Under Pressure” to provide the main beat. However, in the movie, it’s being played in a karaoke bar, allowing the characters to change the lyrics to fit the plot. But the song “Let It Lie,” performed by Common, is probably the best track in the movie. It’s a “Hamilton”-esque hip-hop song that injects the soundtrack with an interesting flavor not often found in animated movies. Not only was “Smallfoot” an unusual and amusing animated film that kids and adults alike will love, it also presented a vibrant, original soundtrack and themes that will resonate with audiences in a meaningful way. With the next wide-release animated feature not opening until November, “Smallfoot” will undoubtedly find some success at the box office, and it couldn’t be more deserved.